THE WILLIAMITE, official publication of Divine Word College of Laoag (DWCL), is holding a congressional forum for contenders in the first district on Feb. 24, Wednesday. 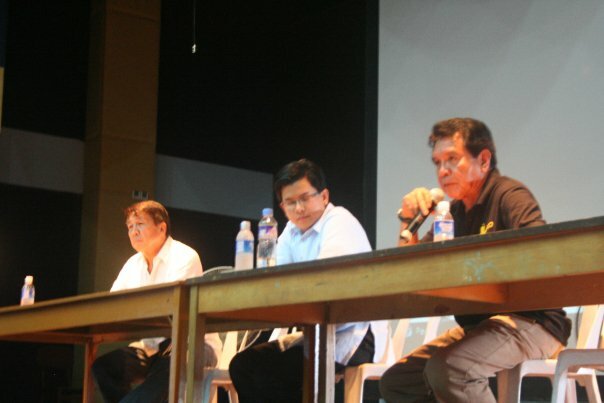 All five candidates—Kris Ablan, Rudy Fariñas, Atong Peralta, Chito Ruiz, and Teteng Sales are expected to participate in this event that will give student leaders, student journalists, professors from different universities in the province, representatives from various sectors, and the general public a chance to discuss salient issues with the contenders. Only 500 persons can be accommodated at the venue, the newly-opened St. Joseph’s Audtorium at DWCL, so better to make seat reservations should you decide to come. Contact Jaime Lao, The Williamite’s editor in chief at 09293051987. Hope you could come, dear karikna, but, if you couldn’t, what questions would you have wanted to ask the candidates? WHOEVER HELPED Governor Michael Marcos Keon (MMK) draft the speech he delivered in his press conference, Feb. 8, must be commended. First off, it seemed spontaneous. “Let me speak from my heart,” he said. And the piece did sound sincere. As a speechwriter myself, however, I know it was carefully crafted and executed. He began by relating the series of events that led to his running for reelection as governor opposite his cousin Imee Marcos. He gave his story, his version of the story, which is very much different from what I heard from Imee in an interview she gave your karikna a couple of weeks back. Anyway, why they both decided to run does not interest me much. It’s given, they are both running. Period. It’s time to move on. The best part came when MMK said that although this battle is the hardest one he ever had to face, he will carry on because he is running not as much for winning as it is for finding personal closure. “I do not want to spend the rest of my life asking myself what the result would have been had I run,” he said, on a very pensive note. He cast no stones on the person of anyone, and tackled the issues on the level of reason. How could you, dear karikna, go against a man who is searching for answers in life, and who is holding on to his dignity? The press conference, broadcast on cable television, was held immediately after Keon’s allies at the Sangguniang Panlalawigan lost the vote on the issue of Tobacco Excise Tax monetization. Such event provided a very good backdrop to the presscon. Emotions were high, and the losers were expecting public sympathy. The governor’s two children from Australia were there, and so were a number of mayors, to show solid support for MMK. IMEE is not at all bothered that most of the mayors throw their support to her political opponent. “Good leadership is not about making the mayors happy. It’s about making the people happy by serving their interests well,” she said. Besides, she is confident that some mayors will eventually cross the fence. “They are just waiting for the right time.” She explains that these mayors do not want to have their projects derailed and so they are sticking it out with the governor, but only in the meantime. HE HAD NO party, no posters, no leaflets, but Jonas Paul B. dela Cruz, a third year Civil engineering student, grabbed an overwhelming win over his three rivals in the Central Student Council (CSC) presidential race at MMSU. Garnering around one half of the near seven thousand total votes cast in the CSC elections held Feb. 4, Dela Cruz reigned the tabulation boards in most precincts. Aside from his landslide victory at the College of Engineering, his home, where he obtained seventy six percent of the votes, he also won big in other colleges and units. Seventy-five percent of the total population participated in the polls considered a breakthrough in the history of campus politics for having the most number of political parties and candidates vying for various posts. Dela Cruz’ closest rival, Bryan A. Corpuz of The 2010 Party, got a 25-percent share of the votes. Gevy Ann R. Villanueva of Tindig MMSU and Reynald Theodore C. Teodoro of Anak ng MMSU had 15 and 12 percent, respectively. LOCAL JOURNALISTS swear they have not seen debates as highly charged as the spectacle they witnessed at the Sangguniang Panlalawigan (SP) recently. Our provincial dads were arguing on the release of the province’s P254-million share in the P5.81-billlion tobacco excise tax due to tobacco-producing provinces. This has been highly discussed in the news, so I will no longer delve into painstaking details, but allow me, dear karikna, to present the primary issue, which is: should Ilocos Norte participate in the Tobacco Excise Tax Monetization Program (TEMP) which would allow the province to get its share in lump sum, or should it subscribe to long-term installments, sans deductions? Under TEMP, we will be able to get our piece of the pie, but less 31.5% in bank interests and consultancy fees. Under the second option, we get almost the full amount. Should the province participate in the TEMP, an SP resolution had to be passed to that effect. This is where the debates transpired. I know you understand why I am interested on this. I am a Philosophy teacher, and coach, too, of university debate teams. Add to that the fact that I am also a dutiful taxpayer. One thing to be watchful for in debates are fallacies, which, as we have learned in our Logic classes, are products of convoluted reason. Here, I listed down some fallacies which were committed both by the SP members, and those who have spoken about the issue in media. First in my list is False Dilemma. Also called Black and White Fallacy, this operates by effacing the various alternatives in between two extreme choices in a particular issue. Thus, the various gradation of gray in between black and white are concealed giving us only two alternatives, black and white. Such is committed when one says, “either you approve the TEMP resolution or you deprive farmers their rightful share.” But, of course, there are alternatives. I do not believe that any SP member is really against the welfare of farmers, and nobody is saying that we should not get the money. The questions are: in what manner?, and how much? If the SP avails of TEMP in toto and as is, farmers will lose around one third of the total amount due them. They will be charged exorbitant fees for money they have already earned. Any self-respecting banker will say that the bank interest of 26 percent and the consultancy fee of 5.5 percent are just too high. With TEMP approved as it is, farmers stand to lose around P80-million. That’s a big loss, very big loss. That means P80-million less government support to agricultural infrastructure and equipment, and to human resource development. If paying interest is inevitable, can we not, at least, bring it down? Fifteen percent, the opposition says, would have been tolerable.